hear the occasional slap of a fish’s tail accompanied by the sweet song of the birds. Your ordinary yard is now transformed into a Zen sanctuary – your own piece of paradise. If we have captured your interest please do not hesitate to contact us today. We would also like to offer a free consultation where we personally work with you to discover unique, creative options that will make your landscape and way of life more satisfying. 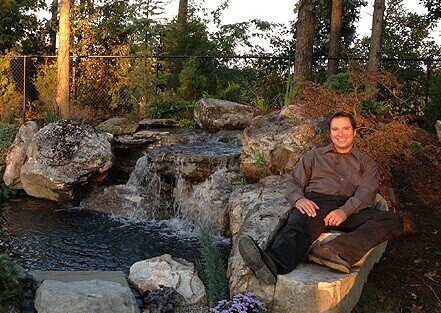 Ultimately we’re a landscape transformation company with the ability to recreate nature on any scale from garden ponds and fountains, to cascading mountain streams, breathtaking waterfalls and Koi Ponds. Peaceful Ponds is for everyone. Areas we Service: Charlotte, Matthews, Indian Trail, Waxhaw, Stallings, Weddington, Myers Park, Eastover, Dilworth, Lake Norman, Lake Wylie and other parts of North and South Carolina.